Languages of Indian origin having a script are to be considered in the list of official Indian languages. India to have a national language. One or more of the languages of non-Indian origin are considered as Link languages. The State to have one official language and one or more than one second official language. The original official documentation of the State to be in the official language of the State. The State can also generate / translate the official documentation in one or more second official languages of the State. Communication of the State with the central government would be through the official language of the state, or through one of the second official language of the state or through the link language. Communication between two States is recommended to be through one of the official languages of any of the two States or one of the second languages of any of the two States. The communication between any two States can also happen through the Link language or through the National language. The communication of State governments with foreign entities requires use of one or more of the Link languages. When ever the link language is used, the documentation should also be made available in the National language. A link language is not an official or a second official language of the State. Central government to generate content in atleast one of the official languages for internal purposes. At least one of the link language is used for external purposes. Whenever, a link language is used, the content is also provided in the national language. Language departments at the State level and at the Central government level are to be established to handle all language requirements. The Language deparments would generate content in the official languages, national language, and link languages and translate the content from one language to the other in an efficient way. The language deparments would also promote official languages listed in the eigth schedule to the Constitution in a systematic way. Langugage related job creation in a systematic way. Patent publications in at least one of the official languages before the grant stage. Effective teaching of at least one link language to the students during the course of education. Audio, video and textual translations to be made available in national and official languages. Linguistic groups and regions to be introduced within the state for effective management of languages. Link languages include English and other EU languages, Persian, Japanese, Korean, Arab and Chinese. National language is Sanskrit. With a loose working definition for a religion (as a set of customs and traditions associated with a broad set of values encompassing one or more aspects of life), various religions may be identified in the last 10000 years of human history. While most of the religions were polytheist in nature for a very long duration till last 2000 years or so, there is a reverse in trend with the consolidation of exclusivist version of monotheism in the last two millenium. Study of religions is biased towards major religions of the day. Major religions are also described as great religions interchageably without justification. Monotheism of Islam and Christianity (and of Jews) is treated, often, as an evolved concept from previous primitive religions. Antiquity of Judaism and Christianity, recentness of Islam are highlighted conveniently not just in media but also in academic circles. In this context, the following is a brief overview of history and features of world religions. The religions of Hindus are oldest, existing even during remote Kritayuga. Jainism dates Rishabha to an ancient period. Zoroaster has a time period of 6000 years before plato. Buddhism was at its peak about 3000 years ago. Jewish traditions consider Abraham about 4800 years ago. Christianity is 2000 years old and Islam is as recent as about 1300 years. Archeological evidences have been found from Paleolithic periods several hundred thousand years ago. Specific burial practices, symbolic artifacts from stone age sites of Africa have proving religious traditions emanating from a distant past. Relatively recent archeological findings such as artifacts from the Upper Paleolithic (50,000-13,000) include the lion man, the Venus figurines, cave paintings from Chauvet Cave and the elaborate ritual burial from Sungir. The Neolithic religions determined from the excavations of Neolithic settlement of Çatalhöyük, had female figurines. The well-formed, carefully made figurines, carved and molded from marble, blue and brown limestone, schist, calcite, basalt, alabaster, and clay, represented a female deity of the Great Goddess type. Although a male deity existed as well. A stately goddess seated on a throne flanked by two female lions – was found in a grain bin is believed be a means of ensuring the harvest or protecting the food supply. The Pyramid Texts from ancient Egypt are eligious texts in the world dating to between 2400-2300 BCE. Time period of Vedas are not known and Hindus consider them as ever existent from time immemorial. All religions of the world from very ancient period to the present day, excluding Judaism, Christianity and Islam, are polytheist in nature. Although Monotheism is defined as belief in the existence of only one god. Polytheism includes all gods, considers universe as gods. Christian Church interprets monotheism in a more restricted manner as a “belief in one personal and transcendent God”. Monotheism, as used herein, refers to exclusivist religions exemplified by Judaism, Christianity and Islam. Dualism, Non-dualism, and qualified non-dualism of India are not exclusivist but are related to polytheism and pantheism. The vocabulary and the discussion about religions is influenced by exclusivist religions, especially the Christianity. The terms zoolatry (worshipping animals), idolatry (worshipping idols), monolatry (one god without talking about others), cosmolatry (worship of cosmos), astrolatry(astronomical), autolatry(self), diabolatry(devils), hagiolatry(saints), heliolatry(sun), selenolatry (worship of the moon) created by Christian perspective of urreligion are not useful in positively characterizing non exclusivist religions. Each of the eastern, early semitic, pre-mohammad, Aftrican and american religions have many of the above descriptions. Hindu religions have all of these characteristics. The study of religions led by Western academicians are crippled by the exclusivist ideas associated with Judaism, Christianity and Islam. If a set of religious beliefs are creating obstacles for an open minded academic study, it is time to shed those religious beliefs and initiate a sincere study of religions. India has finally rejected patent for a cancer drug Gleevac by Novartis after a prolonged legal battle of seven years. The Indian patent office disagreed in 2006, saying that this was merely a reformulation of an existing compound (which had been approved in the US back in 2001), and rejected the application. Indian patent law has a section 3(d) which sets a higher threshold for patentability of inventions in India. Although, Indian patent system is nacent and patent practice is evolving, section 3(d) incorporates newer ideas which are basic to the world wide patent reforms. Most of the advance patent systems, including EU, and US, are moving towards adopting higher inventive step thresholds for issuing patents for newer inventions. Gleevec, used in treating chronic myeloid leukaemia and other cancers, costs about $2,600 (£1,700) a month. Its generic version was available in India for around $175 per month. Although, the cost considerations were one of the reasons for stronger opposition to grant a patent to Novartis, Indian Supreme court did not consider this factor. Many experts, even those who are sympathetic to Novartis, agree that Gleevac was not a strong case. Indian patent office was not considered as capable of taking such an independent bold stance when Glivec has been awarded patents in nearly 40 other countries, including China, Russia and Taiwan. Indian decision helps not only cancer patients in India but also patients from other parts of the world. Indian patent system is moulded on the recommendations of EPO and USPTO experts. Indian patent examiners use search reports generated by other patent offices and the examination of patent applications is influenced by the outcome of related patent applications in US and EU. Indian universities and industries are lagging behind in patent filings compared to many similar organizations in other countries. English language has become official language of Indian patent office. Increased number of filings, processing and publishing patent literature in Indian languages have long term strategic implication for the technological capability of India. Such simple but tactical measures have the capability to protect crucial interests of key industries of India and could bring deserved economic prosperity to many Indians. India has demonstrated its ability to pursue an independent patent strategy with the verdict of Gleevac. It should continue to pursue this path more vigorously in a professional way. There is no need to violate any international treaty including TRIPS of WTO. The Tamil Nadu government has pre-emptively banned the film Vishwaroopam, biggest project of Kamal Hasan because of objections from some Islamic groups. Insiders provide insights into the new technique of vested interests in demanding gratuity through terror tactics exploitinng religious sentiments. The real story being behind the ban points to the money making mentality of vested interests expoiting religion. Not so long ago, Thuppakki directed by AR Murugadoss and starring Vijay, was targeted by the selfsame groups. The producers met the groups and quietly reached a settlement. Rs 25 lakh changed hands, the objections vanished faster than you could say ‘cultural terrorism bribe’, the film released, and the producers laughed their way to all the banks in the land. 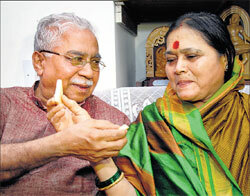 Storyline of the movie: Vishwanath alias Wiz, a Kathak exponent, and Nirupama, get married. Each have an agenda and seem to have achieved their wishes in three years of matrimony. Nirupama gets her Ph.D and Wiz runs his dance class in New Jersey unhindered by each other. All is fine till Dr. Nirupama aspires for more and wants to opt out of the arranged marriage. She cannot cite any specific reason to leave Wiz as there is nothing much to complain about him. Every male according to Nirupama must have a flaw. So she decides to find out something about him to feel better about her decision to part. She hires a detective to rake up something on him. Wires get cross-connected and all hell breaks loose. condemns putting convicts on death row. During the interview, Sarandon said –“ I sent the book to the last one; not this Nazi we have now”. Balaban tried to lighten the mood, by gently chiding the actress for making such an outrageous remark. Nevertheless Sarandon stood her ground and repeated the statement. It is known that the current Pope was once a part of the Hitler Youth Group in his teenage years. He is criticized for his non apologetic attitude towards his past association. In recent years, Pope Benedict is also criticized for his role in failing to stop child abuse by the Catholic priests. Expectedly, the Church and other Catholic institutions havestrongly reacted to statement by Susan Sarandon. Susan Sarandon is an American born actress, who rose to fame after she portrayed a lead role in the movie Dead Man Walking, which was filmed in 1995. She in fact won the best actress award for the film. She is a noted film performer, and has been nominated 4 times for the Best Actress award. She has also made her mark in the socio-political scene, and has given her support to many social causes. Sarandon was born in New York City to a Roman Catholic family. In 1969, Sarandon attended a casting call for the movie Joe, along with her then –husband Chris Sarandon. She was selected to play the role of a teenager, who takes to wayward ways. Between 1970 to 1972, Sarandon enacted a role in a soap opera. In 1974 she played a major role in the movie the Front page. Round about the same year she played a role opposite Robert Redford in the movie The Great Waldo Pepper. In 1979, she enacted the role of the mother of a child prostitute played by Brooke Shields in the movie Pretty Baby. Between 1980 and 1990 she starred in many films like The Hunger, The Witches of Eastwick, Bull Durham, and A Dry White Season. Sarandon has been nominated 5 times for the Academy Award for best actress, for her portrayal of roles in Atlantic City, Thelma and Louise, Lorenzo’s Oil, and The Client. She won the Award for the movie Dead man Walking. In 1994 she was awarded the “Women in Film Crystal Award”. She continues to successfully portray a variety of roles till today. In 2006, Sarandon won acclamation for her active socio-political participation. She received the award “Action against Hunger”. She was honored for her work as a good will ambassador for UNICEF.